Here are a few Bundesliga facts to get your head around before play kicks off for Matchday 24. Hertha Berlin v Werder Bremen pitches Otto Rehhagel against his old club. As manager he was in charge for a massive 668 games in total at Werder Bremen and won two Bundesliga titles. The current Bremen boss Thomas Schaaf was Rehhagel’s assistant, and this will be his 600th game in charge of Bremen. Stuttgart coach Bruno Labbadila also takes on his old club, Hamburg this weekend. This will be his 50th game in charge in all competitions. He was only in charge of Hamburg for 51 games, but was more successful with an average points per game of 1.63, against just 1.45 with Stuttgart. As a coach against Bayer Leverkusen, Jupp Heynckes has won his last two matches by a 3-0 scoreline, but has lost three of his last five encounters. Kaiserslautern v Wolfsburg is a match up of the second worst home side in the division versus the worst away team. Kaiserslautern have only scored eight goals at home, while Wolfsburg have only scored nine away from the Volkswagen Arena. Jos Luhukay’s Augsburg take on Hannover 96 this weekend. Luhukay’s first Bundesliga game as a manager was against Hannover, as interim boss of Cologne in 2003. He is still looking for his first win over Hannover as a coach. If Dortmund beat Mainz this weekend, they will set a new club record of eight straight victories in the top flight of German football. If Hoffenheim draw against Cologne, they will equal the record of consecutive home draws in the Bundesliga. One of the teams that holds that record are Cologne themselves. Freiburg have conceded one more goal than Schalke have scored this season, and Schalke are the joint second top scorers in the division. Enjoy the action from Matchday 24! Jon Hartley investigates what is happening at Hoffenheim. Turmoil or a long term plan? We must always remember that Hoffenheim are still a very young Bundesliga club. Not only that, in their current guise Hoffenheim are not an old either. Dietmar Hopp started investing in the club just over a decade ago, and when a rise has been as rapid as this one, there are likely to be some growing pains. This has been no clearer than in the last year. In just over 12-months, Hoffenheim have seen three different coaches at the helm at the Rhein Necker Arena. 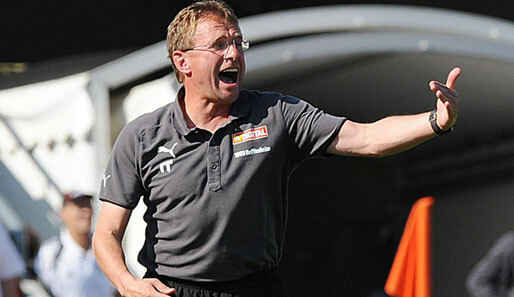 The first was the man who masterminded the clubs rise through the leagues – on the pitch that is – Ralf Rangnick. Rangnick left in protest of the sale of Luis Gustavo to Bayern Munich in the January transfer window of 2011, which was perhaps the first sign that all was not right at the Bundesliga baby. Stepping into his shoes was Marco Pezzaiuoli who was Rangnick’s assistant. Pezzaiuoli’s tenure was an extended caretaker role at best, and pretty unremarkable. The club bobbed around in midtable between 7th and 11th during the entirety of his time in charge, and only picked up an average of a point a game…hardly anything to get the blood racing. But before the end of the last season, Hoffenheim announced that St. Pauli coach Holger Stanislawski would be the man taking the club forward. Having been at St. Pauli for 18-years, the move to Hoffenheim certainly had its pros and cons. In Hamburg he could almost do no wrong. St. Pauli may have been heading for the drop, but he was still the club hero and orchestrated their promotion to the top flight. But life at St. Pauli can never be considered normal, far from it in fact, and after such a long time at football’s favourite madhouse, it was time to move on to something completely different but no less challenging. Hoffenheim certainly ticks the box on being different, but the switch from the Reeperbahn to the Rhein-Necker hasn’t been an instant success, but why should it be assumed that it would be? Every club has its challenges and Hoffenheim is no different. You would think that being at a club that is essentially bankrolled by a monied individual like Dietmar Hopp would allow any manager free reign in the transfer market, but it must be stressed that Hoffenheim are not Manchester City. With recent departures – especially Gustavo – there was a change in attitude concerning transfer policy and it appeared that Hoffenheim had suddenly become a selling club. So even before Stanislawski’s arrival, the magic formula that brought the club to the top table had started to become diluted, and other players were set to head away from Hoffenheim. In addition to Gustavo’s departure, striker Demba Ba fashioned his exit from the club in order to make his way to England and Vedad Ibisevic has also made his move to Stuttgart. But please don’t think that these exits amount to wholesale asset stripping in Sinsheim. By Ibisevic’s admission, it was time to leave Hoffenheim and seek a new challenge, and it was probably time for Hoffenheim to seek a new front man as well. With the selling of these players, it would be easy to look at what has happened at Hoffenheim and think that they have lost their ambition, but I would tend to disagree. I think that Hoffenheim have just started to play the game in the ‘real world’ of football. Even for the mega rich Dietmar Hopp, a football club like Hoffenheim would be unsustainable if he threw good money after bad in a quest for the title. Hoffenheim have become a little more pragmatic in their approach, but I still believe that in the long term they will be punching around the European places. Stanislawski is an ambitious guy, and he is also used to getting success without having a bottomless pit of money. He also needs to fashion his own squad, and is beginning to do that despite the teething problems he’s had with team discipline. Chinedu Obasi and Roberto Firmino were reprimanded for being late for training during the autumn, and Tom Starke had a ticking off for speaking out in interviews. Obasi has now gone to Schalke, and I can only imagine, that its been made clear to the other players what is expected of them. This transition may not be pretty, but it may be for the best. In all this talk of exits, its right to point out that players have been coming in as well. Before the end of the transfer window Hoffenheim signed Ibisevic’s replacement, Srdjan Lakic from Wolfsburg, This should be a good signing for Stanislawski and for Hoffenheim, as Lakic is a player that proved his worth with Kaiserslautern by hitting 16 goals last season. That was enough to attract Wolfsburg to take a punt on him, but sadly not every player flourishes at the Volkswagen Arena, and Lakic was one of the masses who didn’t. But with Stanislawski, Lakic has a situation that he is used to, a manager similar to that of old Kaiserslautern boss Marco Kurz. From the outside, Kurz has the appearance as a manager who likes to support a player, and that is the reputation of Stanislawski as well. Let’s also not forget that Lakic is a player that his new boss knows a lot about. With St. Pauli, Stani went toe to toe with Kaiserslautern and Lakic when they both got promoted, so he knows as well as anyone else the player he is getting. So far from selling the Hoffenheim jewels, the club are investing when needed but also cashing in when viable, both of which could good business for the future. Hoffenheim are no long the silver plated fairy story they used to be, but they could certainly be around to make their mark in the Bundesliga for sometime to come. Also bear in mind that Stanislawski was at St. Pauli for 18-years, so he knows how to stick it out at a club – given the chance and this could be a project for the long haul. Hans von Tschammer und Osten is unlikely to be a name that resonates to any great depth, or which means a notable amount to many. However, next Tuesday and Wednesday, his legacy will, once again, be reprised – albeit in something of a reinvented form – as the DFB Pokal enters the quarter-final stage. Given the post of Reichssportkommisar (later retitled Reichssportführer) in 1933, von Tschammer und Osten had no real interest in sport, to the extent that many believed his appointment was originally intended for his brother. Yet his standing in the Nazi sporting annuls was cemented in 1935, when he announced the formation of a competition “open to 14,000 football clubs”, and donated the resplendent Goldfasanen-Pokal (Golden Pheasant Cup) as the prize, engraved with his name. By Christmas of that year, the very first final had come and gone, with Nürnberg getting the better of Schalke by 2 goals to nil, in front of a reported 55,000 fans in Düsseldorf. As a showpiece of the Nazi ideal, the Tschammerpokal was hailed an undoubted triumph, and began to grow in entrant numbers and popularity. The adoption into the Nazi philosophy was more clearly evidenced just over 12 months later, as the final moved home to the newly-reconstructed Olympiastadion, in Berlin. With its foundations embedded in those of its Prussian-built predecessor, the stadium was the very embodiment of the Nazist mantra, as cast in the unmistakable, quintessential architecture of the time. Having been the predominant site for the 1936 Olympic Games, the stadium was ideal as the venue for a burgeoning competition, and would play host to the final for six of the next eight years. Those early years saw Schalke feature on a regular basis, though die Königsblauen only managed one victory from the five finals they contested, as not even the advent of World War Two could halt the competition. The last knockings of the inaugural version did, however, come in 1943, as the ravages of war finally took hold. And in an ironic twist, as Hitler’s empire began to subside, the Tschammerpokal also left the geographical bounds of Germany, First Vienna triumphing 3-2 (after extra time) over Hamburg. It would be almost ten years until the Cup was reprised, and a further thirty before the final returned to Berlin. In a few days’ time – on the 7th – the minnows of Holstein Kiel will square off against last year’s Bundesliga champions, Borussia Dortmund, in the very definition of ‘a potential banana skin’ for the illustrious visitors. And it was under the rebranded guise of the DFB Pokal that the tournament first began to foster a reputation for being the ‘great leveller’, encompassing the vibrancy and revitalisation being felt across the divided nation in the post-War era. Such was encapsulated in the very first round of its first year back, as the relative unknowns of Concordia Hamburg put the giants of Dortmund to the sword; 4-3. And, as if to fully shed the skin of the memories of past associations, the 1953 final was held on the same ground as the very first, purging Düsseldorf of all remaining connotations. However, one source of discomfort did remain into the fresh, bold age of German football – the Goldfasanen-Pokal itself. By the end of summer 1949, the DFB had been resurrected, and lay under the directorship of Dr Paul Josef Bauwens. The former referee and player had ascended to the helm of the organisation, embodying a more tolerant, inclusive era. With a Jewish wife, ‘Peco’ – as he was affectionately known – found the trophy to remind him a little too much of the persecution and quintessential anti-Semitism of the Nazi machine for comfort. Yet it wasn’t until 1965 – almost 12 months after his death – that a permanent replacement was designed. Weighing around 27kg (12.5lb), and with an estimated market worth of some €100,000, ‘The Pot’ is one of the most iconic and valuable Cups on offer in modern sport, and the eight remaining sides in this year’s competition represent a cross-section of everything trumpeted by contemporary Germany, and envisaged for the prescient nature of her sport. The current format of the Pokal largely dates back to 1974, and the formation of the 2.Bundesliga. Since that point, all Bundesliga and 2.Bundesliga sides have enjoyed automatic entry to the first round proper (along with the top four 3.Bundesliga teams from the previous season). That privilege takes 40 of the 64 spots in round one, with the other 24 coming from regionalliga cup champions (of which there are 21), and the three most populous regional associations. Since 2008, reserve teams have been banned from entering. Rounds one and two then see the amateur/ lower ranked sides given home draws against those of more renown, over 90 minutes, without replays (a decision dating back, once again, to the 1974 season). With last year’s winners – Schalke – having already succumbed, and the other three sides from this year’s Bundesliga top four all drawn away from home, the opportunity for European competition beckons for Kiel, Hoffenheim, Greuther Fürth, Hertha and VfB. The most recent of the eight remaining teams to have enjoyed success (other than Bayern) was VfB, and that was all the way back in 1997, when they triumphed over Cottbus by two goals to nil (though they also reached the final ten years on, losing out to Nürnberg, 3-2). Fürth, Hertha, Hoffenheim and Kiel, meanwhile, have never hoisted the eight-litre pot aloft (the latter two having never even reached the semi-final stage before). Bayern – somewhat unsurprisingly – are the most successful side in the contest’s history, with 15 wins and two runners-up berths to their name. ‘Gladbach have three wins (alongside two further finals), and Dortmund have a 50-50 record over their four final appearances. Whatever happens over the two days of quarter-final action, it has never been more true to acclaim of the Pokal as being in rude health. And the May showpiece – which has been held in Berlin as a matter of course since 1985 – will no doubt produce its requisite carnival feast of colour and football. While other nations’ cup competitions appear on the wane, Hans von Tschammer und Osten’s creation has grown to wondrous proportions, shedding its initial forbearance, and embracing a composite culture in a way that fundamentally celebrates all that is great about German football! The Bundesliga Show is 50! 50 episodes that is, and to celebrate is a bumper show. Niklas Wildhagen of the Bundesliga Fantatic joins Jon Hartley and Terry Duffelen, throughout the show to talk about the Transfer Window and matchday 19 action. Also on the show, with the 2nd Division restarting this weekend, Richard Montague from Football Radar chats about all things 2.Bundesliga…plus is that wasn’t enough even Cologne coach Stale Solbakken makes a brief appearence. Archie Rhind-Tutt takes a look at the Bundesliga’s bluntest attack force, Kaiserslautern. Why are goals so hard to come by on the Betzenberg? Glance at some of the players who have pulled on the blood red of Kaiserslautern. The likes of Michael Ballack and Miroslav Klose played in the South West of Germany. There is one more prominent than those two and in fact, all others. Fritz Walter is a name which will get any German football historian purring with delight. Depending on whom you believe or what you’ve read, Walter is the best forward Germany has ever had. He may not have soured as many goals as Gerd Müller and Miroslav Klose, but he captained and inspired Germany to their first ever world triumph in 1954 under the tutelage of Sepp Herberger. Fast forward to present day and Kaiserslautern are in a relegation battle. Playing at the Fritz Walter Stadion, they have the worst attack in the division, something of an irony considering the attacking players who have played for the club. It is perhaps naive to expect every side from the Betzenberg to be goal crazy just because Fritz Walter played for them. Nevertheless, with Marco Kurz’s side occupying the relegation play-off position currently, it is apt to highlight the problem. Last season, Kaiserslautern finished in an impressive 8th place and considering this was their first term back in the Bundesliga for four years. To replicate this achievement was always going to be tough and Kurz’s side are similar to Mainz and Nuremberg in this respect, having lost key players who played big roles in their success last season. The greatest loss for the Die roten Teufel (The Red Devils) was Srdan Lakic to Wolfsburg. The most painful aspect of his move to Lower Saxony is that he has hardly played since arriving in the summer. His move was agreed to prior to the arrival of Felix Magath and has not found himself in favour with the disciplinarian coach. Lakic played a vital role in lifting the Betzenberg outfit into the top half last year. He scored 16 goals in his only year at the club. In contrast, with just over half of the season elapsed, Kaiserslautern have only registered 13 strikes. The main goal supplier is still present in the Rhineland-Palatinate. Christian Tiffert managed 17 assists and was widely considered one of the best players in the last campaign. He was six assists clear of any other player and yet this season, he doesn’t have a single one to his name. Granted, he has two goals, helping Kurz’s side to two of their three wins against Schalke and Mainz but the over reliance on Lakic last season appears to have become all too clear now. Some results though have been very encouraging for Kaiserslautern. Taking four points away at the Ruhr duo of Schalke and Dortmund, two of the top three, is very impressive. In fact, something which should give Kurz great encouragement is his side’s defensive record. They have the fifth best back line in the Bundesliga and it even extends to third away from home. Despite their precarious position, they’ve only lost two of their last ten games. The problem is the other side to that statistic – no win in their last eight games. It all comes back to goals though. Dorge Kouemaha, Itay Shechter, Richard Sukuta-Pasu and Adam Nemec, the forwards at the club during the first half of the season, grabbed only six goals between them. Now though, Kouemaha has a long term injury, Shechter is suspended this weekend, whilst Nemec has left for Ingolstadt. To bolster his options, Kurz has brought in Jakub Swierczok from Polonia Bytom and Sandro Wagner on loan from Werder Bremen. However, a recovery needs to surface soon. In the next two games, Kaiserslautern face Augsburg and Cologne. With no disrespect to either side, they are far more likely to garner points in those games than against Bayern Munich and Gladbach in the two after. To draw inspiration, the forwards should look towards club icon Fritz Walter. Whether it’s his statue outside the Betzenberg or just the official name of the stadium, he’s certainly a player who Marco Kurz would love in his team at the moment. This week on The Bundesliga Show, Terry Duffelen and Jon Hartley discuss the start of the Rückrunde where it is tight at the top in the Bundesliga. Big wins for Schalke, Dortmund and Gladbach, while Bayern’s defeat means that it is a four horse race at the start of 2012. Also on the show, Jon and Terry are joined by Stuart Dykes from Supporters Direct to talk about the recent Fan Congress held in Berlin, where a huge range of fan issues were discussed, including ticket prices, violence, pyrotechnics and the 50+1 rule. The winter break is finally over and the Bundesliga is about to return to action. Terry Duffelen and Jon Hartley take a look at the first round of fixtures in the second half of the season. As the transfer window is wide open, also on the pod, a look at Papiss Demba Cisse’s switch the Premier League with Newcastle United. Overthe Christmas period I will be importing this blog over to WordPress.org. TheURL www.bundesligalounge.com maybe affected as a consequence, during the changeover. Once the change is complete, I’ll update this blog with any details of feeds etc. Jonand I thank you for your support and wish you a peacefulseason. The Bundesliga Show will be back in January. With the penultimate matchday before the winter break out of the way, Terry Duffelen and Jon Hartley, review the action from week 16 in the Bundesliga. It was bad results for Dortmund and Borussia Mönchengladbach as they lost ground on Bayern…but congratulations to Augsburg who are now off the bottom. This week on The Bundesliga Show Jon Hartley & Terry Duffelen review matchday 15 in the Bundesliga. They chat over the Borussia Battle between Mönchengladbach & Dortmund and the Bayern’s big win over Bremen.Also The Bundesliga Show welcomes blogger on East German football, Dave Tunnicliffe, for an excellent chat about all things East.